The world lost a great mind early this morning with the passing of renowned physicist and cosmologist Stephen Hawking. Best known for his theories on the origins and expansion of the universe, his argument supporting the existence of Hawking radiation (released by black holes), and of course for his conspicuous wheelchair and computerized “voice,” Hawking has fascinated the world and illuminated its brightest minds for decades. Sadly, he passed peacefully and surrounded by family in the early hours of March 14, but his legacy feels just as boundless as the universe he loved so deeply. In honor of his memory, we’ve put together some of the most fascinating facts about the late and great Stephen Hawking. 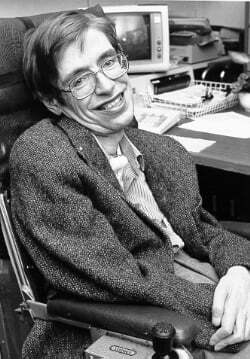 For anyone familiar with Amyotrophic lateral sclerosis (ALS)—also known as Lou Gehrig’s disease—it may seem surprising both that Stephen Hawking showed signs of the disease so young and that he went on to survive for such a long time. While most people first show signs of the disease between the ages of 50 and 60, Hawking was just 21 years old and in graduate school when he was diagnosed. Told by doctors that he had roughly two-and-a-half years to live, Hawking defied all the odds and lived to be 76. We’ve heard before that many of humanity’s brightest minds were not intelligent in the “normal” sense and that many of them struggled in the classroom as children, and Stephen Hawking was no different. Hawking himself blamed his progressive schooling at the Byron House School for his poor reading skills (he claimed he couldn’t read until the age of eight). From his brilliance in cosmology to his morbid and lifelong confrontation with his own mortality, it’s no great surprise that time was always on Stephen Hawking’s mind. Then perhaps he would have found some humor in the very nature of the dates of his birth and death. Hawking was born on January 8, 1942: the 300th anniversary of Galileo’s death. Hawking died on March 14, 2018: Albert Einstein’s 139th birthday.